This tenth volume of Roman Imperial Coinage completed the first edition of the series founded by Mattingly and Sydenham in 1923. Its layout is based on the division between the eastern and western parts of the empire, and the reigns of successive emperors. A further section deals with imitative coinages struck by certain of the barbarian peoples. There are detailed accounts of the monetary system and mints, and of the coin-types and legends. The catalogue comprises some 1,800 entries, each individually numbered, and illustrated by 80 plates. The coinage is discussed not only in its historical setting, but also in a comprehensive and documented conceptual context, making RIC X essential reading for students of the late Roman and Byzantine period, as well as for collectors. 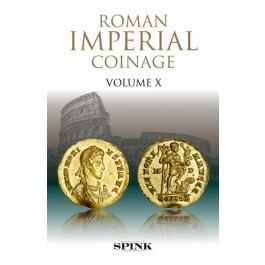 This seminal volume is reprinted by Spink in 2018 to make it available again to all those interested in this fascinating period of Roman Imperial coinage. Dr John Kent joined the Department of Coins and Medals at the British Museum in 1953, and was Keeper from 1983 until his retirement in 1990. As well as being an editor of the Roman Imperial Coinage series , he is the author of Roman Imperial Coinage Volume VIII (1981).